This author loves old expressions, adages, or insights which display wisdom and insights in a brief presentation. However, if you remember the old story about how when it comes to communicating verbal information; that if you gathered a group of people in a circle, and start with one person and whisper something in their ear. And then they whisper in the ear of the person next to them, and continue this all the way around the circle. Then examine the difference between what the first person was told and what the last person heard, the information had changed exponentially to the point of sometimes not being recognized. This experiment tells us something about human communication in general, but more specifically the importance of words, even small simple words, when it comes to communicating information. Information can be distorted much easier when it is solidified within an expression or an adage, wherein the repetition of saying the exact same thing becomes a tool to maintain the remembrance of it (this is why within politics, you repeatedly hearing the same verbatim accusations, because as Hitler stated: “if you tell a lie often enough, people will begin to believe it.”), which is why verbatim expressions can be so dangerous if the saying is wrong, because once they are started and become accepted by the masses, they are almost impossible to dispute. However, in reality, the expression is: “Jack of all trades, master of one.” When this expression is misquoted it would seem to present the idea that humans may know a little about many things, yet not a lot about any one subject. Yet, what Benjamin was suggesting is that our goal in life should be to know a little about everything, yet commit ourselves to being a master of one subject. Mr. Franklin was a man of details and precision, yet when his expression is misstated it seems to promote generality, and a lack of mastery, which is the opposite of what was intended. Therefore, simply because something is in the form of an expression or adage, and often repeated; we should still scrutinize an insight or thought, no matter how much it sounds like common sense. What is unfortunate is that even a cursory search of his life indicates that he seldom followed his own admonition, as he was a teacher of Rhetoric, which we would refer today as a professional debater. Augustine was known for his scurrilous and inflammatory assaults upon those that did not agree with him. He followed this ungodly behavior until the last days of his life. He was noted as being vicious, and vindictive with those that disagreed with him. This goes to show that God uses broken vessels to sometimes produce great insights (such as: “City of God.”), yet, allows us freewill to the extent that the some person could (even be a hypocrite concerning his own teachings) produce another work which could APPEAR to be right, when in reality it is not. This expression APPEARS to be a wise insight concerning division within the body of Christ;however, we must safeguard those things which SOME might consider nonessential, understanding that everything in God’s Word is there for a reason, and therefore essential; if God wanted it communicated to man. And what if this expression is true, this leads us to the next question; who chooses what is essential, and what is not? I have seen hundreds of examples where when Believers that disagree with each other, one uses Augustine’s expression in order to table a discussion of something that they were not prepared to address (by using God’s Word), stating to do so for the sake of unity. However, the reality is that this expression is used as a tool of manipulation to either win an disagreement or least save face while refusing to give credence to the other side. However, this expression has been abused time-after-time in order to bring compromise to the Church, and message of the Gospel (please see Endnote #1) of Jesus Christ. The abuse of this expression has been used more concerning the issue of Eternal Security, than any other Biblical doctrine. 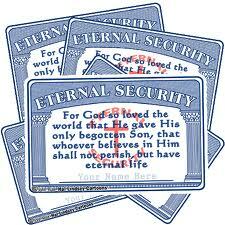 What is the Greatest Issue Concerning Eternal Security? We keep on thinking the issue of Eternal Security is mainly about us, when in reality the true issue is about God. Before going any further, let’s take a look at where this all really begins – it begins with God. “Blessed be the God and Father of our Lord Jesus Christ, who hath blessed us with all spiritual blessings in heavenly places in Christ: According as he hath chosen us in him before the foundation of the world, that we should be holy and without blame before him in love: Having predestinated us unto the adoption of children by Jesus Christ to himself, according to the good pleasure of his will, To the praise of the glory of his grace, wherein he hath made us accepted in the beloved. This is where we need to start concerning salvation, with God, because as Ephesians states, “before the foundation of the world” – in the beginning, before you and I had anything to do with the issue of salvation – it started with God, and us being “chosen in him” (The Greek grammar for the word “chosen” is in the aorist tense, meaning it is “an action that occurred in the past [“once & for all”], to connote complete certainty” – you cannot be un-chosen. “Chosen” is in the middle voice, meaning “the subject & object receives the action” – we, the subject receive it, we do not create it. “Chosen” is in the indicative mood, the mood of certainty – a reality – a fact!) And the English word “us” comes from the Greek word “hemas,” which is a personal pronoun (based upon the plural of the Greek word “eme,” which is the first person singular, personal pronoun), it is the accusative plural translated into the English “me“, “our,” “us,” “we;” words of inclusiveness, not exclusiveness, such as the words you or your. Some have attempted to state that this is referring to Christians as a group, stating that what Paul is referring to here is that before the foundations of the world a group referred to as believers were chosen. However, this does violence to the Greek grammar and the text itself which demands that it speaks to the audience that Paul is addressing which is “to the Saints that are at Ephesus” (And the words Saints can only be interpreted as believers, as the word means those separated unto God, within this context) which is a reference to believers. Paul also includes himself by using this form of a personal pronoun. Do we believe that Paul was not saved. Or do we teach that this generic group which would become believers in Jesus Christ are not made up of individuals which this text does NOT say. If Paul was making a statement concerning a group he would NOT use this particular singular personal pronoun. I can think of no more secure place in existence than being “chosen,” and being chosen “IN“ Him. Yet, the passage goes on to state that we are “predestined… unto the adoption of children… to himself“ (within Hebrew and Roman cultures adoption cannot be undone, there is no legal or moral way to dissolve an adoption – adoption is permanent). (SIDE THOUGHT, when the prodigal son left the presence of his father, and dwelt in the world, acting like worldly men, sinning to the uttermost, no longer acting like a son of his father; at what point was he NOT the son – when did he become illegitimate, NEVER; he was still the prodigal son, the son of his father, just not acting or living like it AT THAT TIME. You see part of the issue that were dealing with is the fact that when we see someone living ungodly, who claims to be a believer, we are not seen them at the end of their life, how they conclude their life, were normally seeing them in the middle or at some point along linear time. God is the only one that sees the ending of the person’s life and knows how they end the race. Why do you think Paul talked about us finishing the race, and NOT the point of us while still running the race – but finishing it. Those opponents which try to use this analogy of Paul concerning a race, that it is those that finish it that are saved miss the point, that when they see a Christian acting like a sinner, they’re not seeing them at the end, they are seeing them in the process. It would be like seeing David after he had arranged for the death of the Hittite, during that year (Yes David lived, unrepentant for one year before Nathan confronted him) that he was backslidden before he came back to his spiritual senses (notice the word “back,” meaning that he was a believer before this terrible sin, and unrepentant time in his life; and that he came back to that which he was), if you saw David at this state according to your doctrine, you would have say he was never saved in the first place. Or what about Peter just after he cursed and denied Christ, if you were standing warming your hands at the fire, you would say that he was not a believer. The point is it is arrogant to observe someone in the middle of their life, or at any point in the process of their life backsliding, bringing condemnation upon them as not being a believer because of where they are at that particular point in time. Quit playing God, he sees us at the end of the race – It is arrogant and presumption to condemn anyone, which is why the New Testament repeatedly demands that we not condemn anyone (many times the word “condemn” in the Greek is translated into the English word “judge,” which is where we have the false doctrine that we are not to “judge” each other. You see we must discern, evaluate, and judge where we are within the body of Christ; so that those that are backslidden can be confronted and a multitude of sins covered over by the blood of Jesus, wherein with each one of us, we have a multitude of sins covered over by the blood of Jesus, at least if were saved). The issue we are dealing with is where someone is at in that time in their life. And making judgments that they are going to hell because they must not be saved because they are backslidden is to bring condemnation, which God NEVER allows us to do. And in so doing, they cause people to doubt that they were saved in the first place, so what they must become saved again, and why would they believe that that would work, if it didn’t work in the first place, so the third time that they are backslidden, are they truly saved if they repent yet again. You see how ridiculous this notion is because no one can be secure where they are because they believe that they hold themselves in salvation, and that what really counts is when they die, where you’re at, rather than who is your savior. The harm in causing people to question their salvation is that they presume that God was not with them in the first place which creates doubt and causes them to decrease in faith, wherein they will always doubt their salvation when they sin – and we all sin, every day. for the rest of our lives, which is why we need the Holy Spirit to aid us in our walk. Perhaps the real issue that the opponents of Eternal Security need to deal with is the fact that they are sinners each and every day of their life, and that they backslide many times in their life, all believers do when we do not follow God’s perfect will for our lives – they never realize because of their own self-righteousness. And as Jesus teaches us in dealing with the Pharisees, the worst type of sin is the spiritual sin of self-righteousness, that of believing that you can control sin in your life, that you are the master of your destiny, that you don’t sin like other men because you don’t drink and commit crime, yet on the inside your self-righteousness makes you as stinking bones, even if you are a true believer. A majority of the people that I have met that do not believe that God keeps them in His grace, by his power, and are therefore secure in themselves, every one of these individuals I’ve met are arrogant and self righteous, and I tell you as Jesus said they are condemned in themselves. So maybe we all need to grab some humility and understand that were messed up people that need God on a daily basis, so that maybe today I don’t do those big sins or as many little sense, though if you’re really truthful with yourself you’ll know that you do what you think of a small sins on a daily basis, in fact saying that you do not sin, is a sin. Consider the following Scriptures, where God the Father givens Believers to Christ – who does the keeping, the Believer or Jesus. The Reason That Eternal Security Is so Important – Is Because it is About God! Therefore, the reason that Eternal Security is so important is because it’s about God, His integrity and ability, rather than the man that is saved. Can God give us to Jesus – yes. Can Jesus keep us – yes. In our self-centered, narcissistic culture we have a hard time separating ourselves from the conversation; yet the reality is we are not the center of the universe, God is (yet it is us that benefit, first concerning our security throughout Eternity to be with Jesus, yet also in the here and now – this doctrine completely changed my Christian walk. It was the 2nd great awakening in my spiritual life. I no longer live in fear, but grow in faith, more than in all the decades before – Please see Endnote #2, “PERSONAL NOTE” concerning this). To state that when someone becomes a child of God, born again, adopted into God’s family; that they can lose that which God chose to do, impugns God Himself. Man has responsibility, but of when it comes to salvation, his response to the action of God saving him, is not the primary act, God’s choosing and Christ’s keeping is. If you want me to explain this, I can’t. Any more than I can explain how Predestination and Free Will function together, nor any more than I can explain how the Trinity exists, where God is one, yet is three individuals; nor any more than I can explain the Incarnation, how Jesus is all man and all God. And by the way no one else can either! However, it is by faith that we accept these truths, not logic (What do we walk by ? – Faith! ~ 2 Cor. 5:7). God is a gentleman and will not force Himself upon us, so Believers can refuse to believe what His Word has said, especially when it seems to contradict itself – which we would refer to as a paradox. The Bible is God’s proof – it is where faith starts! Once this faith is established, there are things in God’s Word that we have to take based upon His trustworthiness and track record (This is the confidence that is a part of faith – remember faith is different than belief, alone. Faith must produce actions, it must produce change, it must produce fruit, it must change one’s life – this is repentance, a change in thinking and in behavior – a change in the direction in one’s life. Therefore, faith is seen in its actions. Some have said that faith can be defined by the acronym [“the ABC’s of faith”], Action based upon Belief, sustained by Confidence [see LINK]. Confidence is gained based upon a repeated behavior of trustworthiness & faithfulness. This why faith must begin and grow based upon God’s Word, where He consistently displays His integrity and ability to do what He has said.) – once God has gained our trust and faith, it is this track record that we hold onto when there are issues which don’t make sense. As is everything in life, you go with who you trust! Some would say concerning this doctrine, “the issue is righteousness,” if a Christian lives a life of outright sin, it would NOT be righteous that God would continue to provide salvation to them with such abuse. On the human plain, it does not seem fair that if I as a Christian deny myself sin to live right before God, and another Christian lives a life of sin, sowing to his flesh, that we would share the same salvation; some might say this is envy. If you closely observe those that condemn the teaching of Eternal Security, you will notice a few obvious trademarks. For one, they will claim that as a believer you can totally stop sinning. They also claim that you can lose your salvation. Their message is usually presented or sprinkled with righteousness dogma, that may come across very rigid, even condescending, displaying a judgmental condemnation of those that disagree with them. These are all traits of individual’s that are feeling envy and jealousy. Their argument always gets back to the fairness of some Christians living a life of sin, indulgence in the pleasures of the flesh while others, such as themselves suffer loss of things, loss of pleasures (sin seems fun, and is pleasurable – for a while, until it’s fruits start to hurt and damage everything around it – “Choosing rather to suffer affliction with the people of God, than to enjoy the pleasures of sin for a season” ~ Hebrew 11:25. Sin destroys! The Spirit gives life. However, self-righteousness is sin in a very deceptive mask.). If this is the case, then these teachers are envious of the pleasures that carnal Believers indulge in and they cannot. Do you understand how immature and carnal this is? Rather than warning and exhorting those carnal Believers that live in sin, praying for them and feeling sorry for them, if they feel envious they display carnality themselves; as well as a lack of discernment concerning sin. I too used to feel envious, that it was not fair; I was jealous. I too became self-righteous. But Godly righteousness in Christ Jesus, it is the power of the Holy Spirit that brings sanctification (1 Peter 1:2; 2 Thess. 2:13), yet we to are to choose not to sin as well, to sanctify ourselves (1 Thess. 4:3), and to set aside those sins that so easily beset us (Hebrews 12:1-2) as well. For him that lives life totally sold out to Jesus, Jesus will reward him righteously for that service (Concerning rewards see Endnote #3 concerning “crowns“). And for him who lives life more for his flesh, yet is a Christian, God is still the Master who saves even a Christian who produces “wood, hay, and stubble“ (Remember: “Now if any man build upon this foundation gold, silver, precious stones, wood, hay, stubble; Every man’s work shall be made manifest: for the day shall declare it, because it shall be revealed by fire; and the fire shall try every man’s work of what sort it is. If any man’s work abide which he hath built thereupon, he shall receive a reward. If any man’s work shall be burned, he shall suffer loss: but he himself shall be saved; yet so as by fire.” ~ 1 Cor. 3:12-15), yet is still saved because of the power of God’s salvation, in spite of man’s sin. However, we must continually remember that all of us have at times lived in sin after having become a believer, even if it was a short amount of time. The point is, not that these individuals make an assertion: “that they say;” but that they claim to NOT commit sin (continuously, not that they can’t stop sinning occasionally, but they cannot stop altogether), anymore; that they have stopped sinning. This phrase is in the present tense, meaning that sin is a continuous action within the life of the human, that cannot be halted, it can never be stopped thoroughly. This makes the point that humans are sinful creatures. In the English, this passage is rendered in the 3rd person, not because John was speaking of himself as claiming to NOT be a sinner anymore, but because of how the English has to handle the grammatical structure of the Greek concerning this statement. To carry the idea to its logical conclusion, if becoming a Believer means that as a Believer the person can stop sinning, then why do they still encounter physical death. And to those that would say Paul was speaking of his past life, the grammar absolutely says the opposite. The verbs he uses are in the present tense ONLY, meaning that: that which he speaks about, sinning, is a continuous action, that never stops. And if this ability to stop living in sin, meant a Believer lost their salvation if they did so, how do we address the fact that David, “a man after His [God’s] own heart” (1 Sam. 13:14; Acts 13:22), who after having become saved according to his faith in God (that God would provide a Redeemer that would purge him from the penalty of sin – this is Biblical faith unto salvation in the Old Testament); David spent a whole year backslidden, running from God after he had illegally and ill-morally taken Bathsheba, arranged for the murder of her husband, and lived unrepentant until God sent Nathan to confront him a year later (2 Sam. 12:1-13). You can’t become much more of a backslidden Believer, deserving to lose your salvation than to live in sexual sin, commit murder, run away from God for a whole year; than what David did. The point is God is not mocked, this sin produced terrible consequences for David, his offspring; and the nation of Israel; yet it did not cost him his salvation (or his life ~ 2 Sam. 12:13 – “ The LORD also hath put away thy sin; thou shalt not die.”) – because he didn’t get himself saved in the first place, he could not keep himself saved; therefore he could not lose what he did not get, it is all a gift from God. The issue is not our ability to maintain our salvation, or our inability to hold onto our salvation. The issue is God’s integrity in fulfilling His Word where He has proclaimed that He will keep us, that none shall be lost. The Greek is very plain here, to those that Jesus gave eternal life, they shall never, ever, ever perish. This is stating that there is nothing in existence – not a single thing, including another human, or even the human himself that has this salvation; that nothing what so ever in all of existence that can pluck a man out of Jesus’ hand. There is no way around this, if God gives someone eternal life; there is no way that they can lose it, not even by their own actions, and nothing can defy God’s Will or His power! because it’s about the integrity and ability of God Himself. There are four pivotal passages which APPEAR on the surface to support the opposition to Eternal Security which will be addressed first, with the pertinent text underlined. Matthew 7:21 – 22 – Addresses those that look like Christians, yet are not. Matthew 12:30-35 – Addresses the unforgivable sin, blasphemy of the Holy Spirit. Hebrews 6:4-6-9 – Addresses those that once were enlightened, falling away. Hebrews 10:26-27 – Addresses those that willingly sin after having received the truth. 1) Jesus does not answer their assertion that they had truly prophesied, or cast out devils, or did wonderful works (as though God needs to justify Himself, or answer man’s assertions); and in the case of casting out devils or wonderful works, whether the miracle were done in response to the recipients faith (just because a wolf in sheep clothing is leading a service, this does not stop God from answering the prayer of a true Christian in the audience – even if some mistakenly think the wonderful work was done by the false teacher, God will heal who He wishes), or even if the wonderful work could be a false sign. 2) The real question is not if they knew about Jesus, but if He knew them. Question one, can a non-saved person prophesy, cast out devils, or do wonderful works in Jesus name. I know of NO text that says that they cannot. When Moses threw down Aaron’s rod, which turned into a snake, the pharaoh’s priests threw down their rods which also turned into snakes, therefore duplicating the same miracle (Exod. 7:17). The priest’s snakes were not fake snakes, or allusions, simply snakes that did not have the power that Moses’ snake had. And what about the False Prophet of the book of Revelation (Rev. 13:13)? The point is, if there was an exhibition of supernatural power: was it of God, or that of Satan. And we know that though God cast Satan upon the earth with his fall, God did not strip Satan of all of his power. In the last days, both the False Prophet and the Antichrist will do false miracles; these are real miracles which occur. However, the falseness concerns who they really are (and who they represent), in order to gain credibility that these miracles give them based upon false assertions. A Satanic miracle may appear be a genuine God-orchestrated miracle to the recipient, as in the case of a healing, yet the purpose is not to do good, but to give credibility to the performer, who is a fraud in his representation. Question two, the main key point of this text is that Jesus did not know them. An example of this can be seen in the fact that you may know who President Obama is. You have seen him on TV, you heard his speeches, and perhaps even voted for him, yet he does not know who you are, and therefore you do not have entrance into the White House based upon your false claim. There are many people who know of Jesus; and many that distort His Word, that do false acts of kindness in His name, and perhaps appear to do miracles at “miracle healing crusades,” which in fact is God responding to the faith of a recipient who is a true Believer. It might appear that the miracles are done by the false prophet, teacher; both of which are merely performers in whom Christ does not hold an intimate relationship with, whom Jesus does not know. And as the passage states it is not the person who claims that Jesus is their Lord emphatically (“Lord, Lord”- said twice to express emphasis, to display that they were emphatic in their claim), but him who does the will of the Father (Matthew 7:21b; Matthew 12:50), and pleases Him by exercising faith (Hebrews 11:6), which is not mere belief (which is merely cognitive, but faith which is life changing), but acceptance of the Gospel of Jesus Christ, and His atoning work – “this is the work of God, that thy believe on him whom he hath sent” (John 6:29). Also, the Greek grammar does not indicate that Jesus knew them at some point in time, and then no longer knows them presently. The grammar insists that Jesus never at any time knew them – this is absolute proof that these individuals were not believers that had lost their salvation. Starting with Matthew 12:10, we see that the Pharisee’s plan to entrap Jesus. Jesus “went into their (notice the emphasis that the Holy Spirit places on identifying the synagogue as “their synagogue,” as opposed to “God’s synagogue,” or even simply “the synagogue” ~ Matt. 12:9) synagogue” on the Sabbath, and having a man with a withered hand presented to Him (“...behold…” & “…And they asked him…” – the Greek grammar is more precise how the Pharisee set the situation up), the Pharisees asked Jesus if it was legal to heal on the Sabbath. Jesus answered them, and then healed the man, and later a man possessed by a demon was brought to Jesus who was blind and dumb. Jesus also healed him and in response to this situation, as seen in verse 23, the people said, “is this the ‘Son of David’?”, which is a Messianic title. When the Pharisees heard the people asking if Jesus was the Messiah, they retorted that Jesus cast out a devil by the power of Beelzebub, the prince of the devils. Jesus responded to their accusations, as well as their thoughts, stating that a house divided falls, and then used an illustration that it is God who is more powerful than Satan, and therefore has empowered Jesus to do this miracle. Next we have verse 30, where Jesus says that He that is not for me, is against me (notice that there are only two positions, and no mention of going back and forth between them – consider this in reviewing the bold paragraph below regarding verses 34 and 35). Jesus states that everything is forgivable except for blasphemy of the Holy Spirit, which is exactly what these Pharisees had just done. There must be a deliberate and calculated determination to slander, it cannot be accidental, but must be a premeditated insult of the Holy Spirit. Therefore, blasphemy of the Holy Spirit is to speak evil of, or slander the Holy Spirit with the deliberate intent of doing so, this cannot be accidentally committed; it must be a conscious and calculated determination to slander with full intent. Blasphemy of the Holy Spirit cannot be a mere slip of the tongue, but must be a deliberate and thought-out accusation against the Holy Spirit (this answers the question of those that fear that they can accidentally commit this most grievous sin of all sins), by knowingly attributing to the power of the Holy Spirit as having come from Satan, not God; knowing that this is a lie. One other point that must be understood is that the blasphemy must be against the Holy Spirit, as opposed to God the Father, or Jesus Christ the Son; apparently both of these forms of slander are forgivable; but why. The answer is that the Holy Spirit is the power of God that functions upon the earth; it isn’t some kind of superstitious or mystical function, the Holy Spirit is God’s power exhibit here – in the seen world. When God moves supernaturally upon the face of the earth, He does so through the orchestration of the Holy Spirit. Even when Christ was incarnate on the Earth, He did not function within His own power as deity, He did so when the power of the Holy Spirit came upon Him from upon high. This is why He did no miracles until after He was baptized in the Holy Spirit. This is why He said He could do nothing in Himself, and that He truly became a man (Phil. 2:7-8), concerning his attributes, yet he always maintained is deity in his essence (the incarnation is a mystery, yet we know that Jesus was fully God, and fully man. He displayed the human attributes of limitation, voluntarily while maintaining the essence of deity, which can never be stripped from Him. Please see our essay concerning the “Attributes & Essence of God” in order to grasp this more fully LINK). Therefore, to slander the Holy Spirit is to slander the display of God’s power – When the Holy Spirit moves it is a visual exhibit of God, and to slander Him is to slander God fully knowing you are slandering the true God of the universe, the real God, without acceptation. You’re NOT slandering some idea of god, some religious system, some MAYBE something – you are knowingly slandering the real deal because you see the miracle, the wonders, the power, and known the source is real – is God. Personal Note: I have been approached by many people on this subject, those that had been fearful that they had accidentally blasphemed the Holy Spirit, which according to the above example cannot be accidentally done. We must take the Scripture at face value without presumptions, and if the only example we have of blasphemy of the Holy Spirit is when the Pharisees attributed a miracle of God done through Jesus, and state that He’s doing it in the power of the devil, knowing it is a lie (Remember Paul, he accused Believers of working for Satan, of doing what they did in Satan’s power; He did not know it was God that was behind their actions – he did it in ignorance), we cannot extend it beyond that. I believe that the only way to commit blasphemy of the Holy Spirit (which only has one example in Scripture); is to knowingly and falsely accuse Jesus Christ, during His “First Coming” of committing a miracle in the power of Satan, and do it for personal gain (the Pharisees did this because of the jeopardy of losing their position and holding with the people – they did it for personal gain, not because they actually believed that Jesus was of Satan, otherwise it would not have been slander – it would’ve been an accusation, and could have been said in ignorance – which is what Paul did prior to his conversion, and was forgiven. We must not forget Paul’s example – you have to know that you are slandering the work of the Holy Spirit, if you truly do believe that a miracle could be an act of Satan, you have not slandered the Holy Spirit – Paul truly did believe that the Christians were following a false god, which would a demon or Satan himself), rather than the power of God in the Holy Spirit; when it is Biblically obvious according to the prophecies concerning Jesus being the Messiah, as well as clearly opposed to the Biblical teaching that God is more powerful than Satan. I view this Scripture the same as Hebrews 6:4-6 (see below “Limited Partnership“), in that it could only be fulfilled during a certain time in history, and under certain conditions; which are now past and not possible. Otherwise, if to truly commit blasphemy against the Holy Spirit means that you knowingly understand that an individual is doing a miracle in the power of the Holy Spirit, and then knowingly accuse them of what you know is a lie. How would you know this unless the individual is fully accredited of God as being a person that only acts for God, and never for the flesh or the devil? The only one qualified person to fit this description is Jesus Christ Himself. If a faith healer claims to be a representative of God, and does healings, how do I know that he is really working for God, in the power of the Holy Spirit, I do not. And, it is in knowing that what you are saying is actually a lie that makes it blasphemy, you must slander the Holy Spirit, which means that you must positively know that the human doing the miracle in the name of the Holy Spirit, is truly His representative. I would never give any human being this type of credit. I believe in healings, I’ve been healed, and I’ve seen healings. But no man receives carte blanche acceptance that what he is doing at any individual time, is an authorization that he is the Holy Spirit’s representative (how do you think that the False Prophet will present himself if not as a messenger of God – his deception is not in the miracles, but him who he really is, and who is his master). How many times have we seen in the Old Testament God’s representatives acting in ungodly manners and doing things wrong? How can you trust that every act that a person that presents himself as a prophet is done so according to God’s will and in the power of the Holy Spirit. If a miracle happens; praise God, but don’t praise the man, or even assume he is beyond question. If the miracle goes against Scripture, then it is subject to question. But the point is, there’s only one human being that has ever lived on this earth who we know 100 percent of the time functions only as God’s representative, and that when He does a miracle, it can only be attributed to the Holy Spirit – it is Jesus. It is this individual – Jesus, that if we chose to knowingly accused of functioning in the power of Satan, while understanding that He is functioning in the power of the Holy Spirit, it is this type of slander that is specific to the sin of blasphemy of the Holy Ghost, and doing so for personal profit as the Pharisees did. “The backdrop of this passage is that the Jews who had just witnessed a mighty miracle of Christ should have recognized that Jesus performed this miracle in the power of the Holy Spirit. After all, the Hebrew Scriptures, with which the Jews were all familiar, prophesied that when the Messiah came He would perform many mighty miracles in the power of the spirit (See Isaiah 35:5-6). Instead, these Jewish leaders claim that Christ did this and other miracles in the power of the devil, the unholy spirit. This was a sin against the Holy Spirit. This shows that these Jewish leaders had hardened themselves against the things of God. I believe that Matthew 12 describes a unique situation among the Jews, and that the actual committing of this sin requires the presence of the Messiah on the earth doing his messianic miracles. In view of this, I don’t think this sin can be duplicated today exactly as described in Matthew 12. And the language does not appear to extend it beyond its local application. There are passages which SEEM to alluded to this sin. However, if God has chosen not to specifically instruct us concerning this sin, we should not play with such a dangerous subject – to do so is reading into the Scriptures, and placing yourself in a position of grandiosity; where it is only God who condemns. And obviously, 1 John 5:16 is not a reference to blasphemy of the Holy Spirit, in that it is not named, nor referred too. We also note in the next verse (17) that John seems to note that the sin as being nonspecific. We know there are sins unto death such as disrespecting the manner that you take the Lord’s supper as seen in 1 Corinthians 11:29-30, as well as Ananias and Sapphira deception as seen in Acts 5:1-11. Yet, neither one of these sins that lead to death are as serious as the sin that leads to eternal damnation and is unforgivable, such as blasphemy of the Holy Spirit. God does nothing unfair, if there is a sin that you and I can commit that is not forgivable, would our loving Father not be sure to warn us in such a way that we would not accidentally commit it? To read into 1 John 5:16 that it is a reference to blasphemy of the Holy Spirit, is to extend into this passage meaning beyond its intended meaning by the writer, and is therefore incorrect and unbiblical. There is a principle within the Bible of repetition (some have called it the “Principle of Repetition”), wherein God repeats Himself to assure that He’s not misunderstood. The Torah is riddled with examples of this, to the place of exhaustion. This principle can be found all through the Scripture (the apostle specifically taught about the principle of repetition – Philippians 3:1; Titus 3:8, 2 Peter 1:12-13, 2 Peter 3:1-2). If God states something only once, there is a specific reason for it, which is manifested when the passage is understood. However, when it comes to danger and warnings, God is always repetitive, as any good parent would be, so since the issue of the so-called “unforgivable sin,” or better stated “blasphemy of the Holy Spirit” would be one of these dangerous examples, and God has not produced more Scripture to warn us, it makes no sense that it is something that is so easily done unknowingly. What is also in view here is that if someone denies that Jesus did His miracles according to the power of God in the Holy Spirit, then they equate Him with sin, as well for lying, which also calls into question the Deity of Jesus Christ. Therefore, they cannot place faith in Christ as the Son of the living God, as their propitiation for sin – and be saved – this is an unforgivable sin. This would also mandate a predetermined mindset, which could not be an accidental sin of omission or commission. And this would circumvent any opportunity for repentance having thought through the position and concluded that Jesus was not the Messiah. Jesus Himself spoke about the necessity for changing one’s mind, which is repentance6 (A changing of mindset and life pursuits from carnality to God’s Will), and any refusal to accept God’s only propitiation for sin necessitated damnation, and therefore was unforgivable. Text: In the sense of speaking evil of God this word is found in Ps. 74: 18; Isa. 52:5; Rom. 2:24; Rev. 13:1, 6; 16:9, 11, 21. It denotes also any kind of calumny, or evil-speaking, or abuse (1 Kings 21:10; Acts 13:45; 18:6, etc.). Our Lord was accused of blasphemy when he claimed to be the Son of God (Matt. 26:65; comp. Matt. 9:3; Mark 2:7). They who deny his Messiahship blaspheme Jesus (Luke 22:65; John 10:36). Blasphemy against the Holy Ghost (Matt. 12:31, 32; Mark 3:28, 29; Luke 12:10) is regarded by some as a continued and obstinate rejection of the gospel, and hence is an unpardonable sin, simply because as long as a sinner remains in unbelief he voluntarily excludes himself from pardon. You cannot commit do this by accident, without intent, it is God you are slandering and you know it because the holy spirit is the proof of god right in front of you. You are calling what you know is divine, evil. That is why it is unforgivable, because you know 100% what you are doing, no mistake; you are telling god he is evil and you want nothing to do with him. When a person does this he is not going to change his mind – it is done! There is an absoluteness concerning this verse, and what is not seen is a changing from good fruit to bad fruit. Nor is there seen a changing from bad fruit, to good fruit, or back again to bad fruit. The idea is either something made good, or something is made bad, corrupt. This example supports the idea that something either is or is not, but there is no presentation that something changes back and forth, therefore either a man is predestined from the foundation of the earth to be the elect, according to the foreknowledge of God (or rejected according to his rejection of God), predestination (by his own choice) for hell. Again stating that either something is good or something is bad, and that a tree will display its fruit in the same way that a man will eventually display by his words or works, his true essence. Again this opposes the idea that one could achieve salvation yet to lose it, or express a transformation from one state to another. This is a Hebrew fact; yet, is never taught to Christians, see Endnote #8 (Gal. 4:1-7), below. In the same way that a youth born in the Jewish house was considered a slave until he became an adult and was therefore adopted as the heir, so is the Christian prior to the point of conversion. He is of the household, yet holds no rights nor privileges; yet awaits the time that he becomes a full heir (in this application, a full “partaker”, or partner with the Holy Spirit in his salvation, not a limited partner as seen in Hebrews 6:4, see below) in the household. The same is true of the believer prior to his conversion. God in His foreknowledge has predestined those that He knew would respond according to His free gift of salvation based upon faith in Jesus Christ, and those that would yet respond in time, are still His; it is time that must progress to fulfill reality. The above Scripture in no way supports an idea of going back and forth, between good and bad, between saved and unsaved. The Holy Spirit watches over the convert prior to their conversion in time. There are no surprises in God’s kingdom; He is either Lord and King and God of all, or nothing. His children are safe and secure until that point that they become heirs of the kingdom. Prior to Jesus, individuals were saved based upon their faith in God and Him providing a substitute for their sins, which they knew would be the Messiah. And that upon death they would go to a place we know as paradise, referred to as “Abraham’s Bosom” where the believers were held temporarily until the promised Messiah. By way of example, many times Jesus would tell a story, and state “that there was a man”, or use some other reference which indicated that the story he was telling was a contrived allusion that was utilized to impart a deeper truth. However, if Jesus ever named an individual name in the story, the story would have to be true or else Jesus would be lying. As such, when Jesus speaks about Lazarus and the rich man (Luke 16:19-31), we know that this is a factual account, and not a fictional illustration. In this particular story, we have two individuals die, one goes to Hades (simply called “the rich man,” no name mentioned, thus done to show that there was no relationship between God and him), and the other Lazarus (“Lazarus,” he was named to show a personal aspect, a relationship with God. Some have misstated that being poor got him in with God, made him acceptable with God, untrue – faith creates acceptance with God alone. Being recognized by God, which displayed a relationship in contrast to not naming the rich man, this relationship is only possible by him living in faith ~ Heb. 11:6; 10:22-23), to Abraham’s Bosom. From this story were made aware that prior to Jesus purchasing salvation and therefore opening up the kingdom of God to man at the cross, that those individuals that were deemed as saved, due to their faith in God (Heb. 11:32-40 – “39“), upon death were held in a temporary holding place which the Jew referred to as Abraham’s bosom (due to Abraham being the father of the faith, and therefore their greatest example of faith; and the bosom was recognized as a term regarding closeness, as in being close to one’s heart – as a baby held close to the bosom – 1 Kings 3:20; as John being next to Jesus’ bosom – John 13:23), until the Messiah would come, and make a way unto God possible, as Jesus would by dying in the cross. Therefore, when Jesus came, this changed the issue – NOW heaven was opened up to those that lived in faith. Because now the Messiah was manifest and salvation, which was in the Old Testament was general in its prior focus, now became specific concerning who that focus was to be upon – Jesus, he was the Messiah who would fulfill Isaiah 52:6 – 53:12 – with Christ fulfilling the rest when He returns the second time. Whereas, in the past; saving faith was based upon an absolute trust in God, and God’s Will in an individual’s life, and that God would provide salvation; now salvation was specific concerning the route of how salvation was achieved. From this point on, no more temporary holding place, when a Christian dies they are with Christ. The book of Hebrews is written to Jewish Christians concerning those issues which affected them, as opposed to Gentile believer’s issues. Among the many issues central to the Hebrews was that of converting from Judaism to Christianity, and the fact that to the Jews this was anathema (“Damned of God”), as a heresy. We 21st-century Gentiles have no capacity to understand what this meant to the Jew in Jesus’ day. For the Jew, the Temple in Jerusalem or the synagogue in outlying areas was the reference point of their daily lives. The trade guilds that journeymen belong to were run by the synagogues, the markets which provided food were run by the synagogues. synagogues are the place of meeting, the place of marriage, and the place of family was the synagogues. Therefore, to become a Christian meant to completely change one’s life, and completely lose one’s identity, ability to make money, provide the necessities of life, and even congregate with one’s family. This is the paramount issue this book addresses, that of forsaking the truth concerning Christianity, and returning to Judaism, which is to “crucify Christ afresh”, by returning to the Levitical system. How unusual, that for centuries, before Christ, the Levitical system was God’s tool, which now became a hindrance. And for the Hebrew, who is a new convert to Christianity, not established in their faith, at that place of determining their commitment to Christ, how detrimental is this choice. This is what Hebrews 6:4-6 is dealing with, not the person who has become firm as a Christian – not one that has actually become a Believer, who is not saved. And though it would appear that the individuals in question are fully Believers, the text says otherwise. The Greek word “partaker” has usages which include “limited partnership,” (Greek: metochos, meaning “partner, though limited.” Used only once in the New Testament in this form of the word regarding the grammar – here in the Dative Case [an indirect object, “with“], Plural Number, and Masculine Gender. This grammatical form displays a limited, indirect partnership), such as seen in the above Luke passage wherein there was not a full partnership, they did not share in the full experience in the same way, in the same ship, receiving the same load of fish, Simon Peter and Andrew went back out alone at the charge of Jesus, their ship started to sink, unlike James’s and John’s ship back at the shore (Simon Peter and Andrew were in their ship which was being over filled, and James and John in the other ship which was not – these were partners in fishing – yet, separate ships, separate owners, separate businesses, separate experiences – unlike the relationship that the Believer has with the Holy Spirit who now lives within the Believer in a non-separate manner. Believers before Pentecost, before the Church dwelt with the Holy Spirit, who was with the Believer, but not in full partnership, dwelling inside the Believers after the creation of the Church at Pentecost – as seen in John 14:17, which states: “Even the Spirit of truth; whom the world cannot receive, because it seeth him not, neither knoweth him: but ye know him; for he dwelleth with you, and shall be in you. ), came to help them. These two ships were limited partners, separate – but still two, and there was not equality – there was a limited partnership with another ship. Another example which is more pertinent can be found in Hebrews 1:9, which speaks about Christ and His relationship to Angels and uses the same Greek word, metochos; and the same exact grammar as the Hebrews 6:4 passage (where the Case is in the Accusative, Plural Number, and Masculine Gender). In this passage it is not saying that Christ is a partner with Angels, displaying equality; but that both Christ and Angels are servants, messengers of God. The relationship is not that of intimacy, the same wherein the individuals spoken about in Hebrews 6:4 are not intimate with the Holy Spirit, with the Holy Spirit living within those people as He does with Believers. When the Holy Spirit brings a person to the place of decision about conversion, there is a process which takes place in completing the terms of their conversion. The Holy Spirit is with them, but not living in them until the person becomes truly Born-Again, a true Child of God; this is where the relationship becomes intimate; wherein the person becomes a real partaker with the Holy Spirit. I personally believe that God gives every person a chance to choose, with their eyes wide open, to receive the Gospel of Jesus Christ (based upon: 2 Pet. 3:9; 1 Tim. 2:3-4), an opportunity to join in relationship with God – to become a full partner with the Holy spirit. The Holy Spirit is called the “comforter” (Greek) paraklētos, also means an “intercessor,” an “consoler,” an “advocate,” who comes alongside the Believer and helps them walk (as in when someone has a hard time walking, and another comes along side them, and has the person put their arm around the neck of the helper, who helps them walk – this is one of the functions of the Holy Spirit as their partner with the Believer), the Holy Spirit is the Helper who partners with the Believer. And though we can refer to the date and time that most of us accepted Jesus Christ, we must realize that the Holy Spirit had been moving us to that point for quite some time (in fact, we are really “chosen” since the “foundation of the world” ~ Ephesians 1:3-5). This is a reference to that point in time where God in his fairness and justice gives every individual an opportunity to respond to him in faith, the Holy Spirit enlightens them. Yet, what is not conveyed is a permanence. Again, what is not conveyed is a permanence. The grammar for both words is that they both are in the Aorist Tense, meaning that the Action Occurred in the Past (“Once & for all”), it is used to connote certainty. If the person was truly saved their illumination and tasting would not have be in the past, which is meant to display that it occurred once. If this was a reference to a born-again Believer, wherein the illumination and experience of the Holy Spirit would be a permanent aspect of their life, the Greek grammar would’ve used the Perfect Tense, which would’ve meant that they received it and it was continuous, never stopping. The grammar cannot be disputed concerning this, with the Believer the enlightenment and experience is always in the Perfect Tense, as is seen throughout the New Testament; never temporary. Only temporary when dealing with someone who is given the opportunity to respond to the Gospel, yet in response rejects it, this is when the Aorist Tense is used. “There is but one sin spoken of in the book of Hebrews, namely, the act of a first century Jew who has left Judaism and has identified himself with the visible Christian church, who having made a profession of Christ now was in danger under stress of persecution, of renouncing that faith in going back to the abrogated ritual of the Levitical system. It is described in chapter 2:1 as a “slipping away from the New Testament truth,” a “hardening of the heart against the Holy Spirit” (3:7,8), a “falling away,” and a “crucifying the son of God afresh” (6:6), a “willful sin” [10:26] consisting of three-fold sin against the Triune God, “treading underfoot the son of God,” [10:29] . A sin against the father who sent the son, “counting Jesus’ blood as common blood,” a sin against the Son who shed his blood, and “doing despite to the Holy Ghost,” a sin against the Holy Ghost who led them to the place of repentance (10:26, 29). From early manuscripts we have two illustrations of its use: “if the terms of the contract be broken,” and where it is used of a person who falls back to his earlier interpretation. These two uses fit exactly into the historical background of the book, and the context in which the word is found. Here is the case of Jews who professed faith in Christ, who going along with the Holy Spirit in his pre-salvation work, had been brought in to the place of repentance, to the very threshold of salvation. They had made a contract so to speak with the spirit, willingly been led along by him. Now, should they refuse the proffered faith and return to Judaism, they would be breaking their contract which they had made with the Spirit. Again, at one time they had adhered to the sacrificial system of the First Testament. Then they had left it to embrace the New Testament truth. Now, should they return to the Temple sacrifices, they would be reverting to their former opinion regarding the same. t could only be committed in the first century and by a Jew, or a Gentile proselyte to Judaism, and for the reason that conditions since A.D. 70 have been made such as to make in possible the committing of that sin. The Temple at Jerusalem was destroyed on that date. There are no Jewish sacrifices to leave nor to return to. This was apostasy, a most serious sin. These Jews had been made partakers, limited “partners,” see Luke 5:7, same Greek word, of the Holy Ghost, going along with him in his pre-salvation work. In remembering the rule of “Expositional Constancy,” wherein the Holy Spirit uses types and models in expressing spiritual attributes, ideas, and realities – these are idioms, metaphor, allegories, and other figurative devices are to help explain something. The Holy Spirit does not change these types, meaning he does not use the same symbol for different expressions/reality. There may be one or more types of a truth or reality; yet, they always follow the same typology throughout all of Scripture (both the Old Testament and New Testament, even though one was originally written in the Hebrew language, and the other in the Greek language; both Testaments have the same author, the Holy Spirit). An example may be that the Holy Spirit is represented as oil, fire, cloud, dove, and living water; however the symbols are not used to represent anything else but the Holy Spirit or functions of the Holy Spirit, such as the anointing of oil concerning a function of being accepted and led by the spirit, or the “water of the word“, which is a function of God’s Word being utilized by the Holy Spirit in the life of the believer. Even when fire is used concerning judgment, it is the Holy Spirit that God is using in the process. Another example is Silver, which is always reminiscent of blood in connection with redemption, gold is synonymous with deity, thorns are a type of sin, brass is a type of judgment of sin, water is reminiscent of God’s Word, and the list goes on and on. The point is everything in God’s Word has meaning, beyond the superficial; which is never seen so clearly as in the teachings of Jesus. In the prior example (Hebrews 6:6-8) you’ll see that “Earth” is pictorial of man (see Genesis 2:7, which is a word-play as the word: “man” comes from Earth – there’s always a connection), (see Genesis 3:15, which is a reference to Christ as the seed of woman, and it is the words of Christ which brings salvation as found in the Bible – Christ the seed speaks the words of the Gospel, the seed; which is used to reproduce Himself in Believers. This is why it is called “Expositional Constancy,” expositional means to uncover or do bring forth and display, and consistency means uniformity, therefore “Expositional Constancy” means to uncover and display that which is consistent and uniform. This is what typology is, it is not superstition or legend, or myth), “rain” is pictorial of God’s Word, and that which “bringeth forth thorns and briars” are those who are unsaved, that will receive the judgment of condemnation to burn in hell for eternity. Another example of this can be seen in the typology wherein God’s word uses birds or fowls as Satan’s helpers – fallen Angels, that are used in order to fight against the gospel when an individual at the point that they have enough sight from the Holy Spirit to consider the validity of the gospel. It is these falling Angels that attempted to devour the Word of God from coming to fruition in these individuals. In considering these stories of Jesus, we understand that based upon Biblical typology, the seed is the Gospel (word of the kingdom), and the soil represents man – his heart (which both in the Hebrew and Greek languages do not mean the emotions singularly, but means the total inward make of a man; 1) His mind, 2) His emotions, and 3) His “seat of the will,” were discretion lives – volition/choice), the birds represent the “wicked one” or his emissaries, the stony places represent those that heard the Word with gladness, yet because of the stones (“the things of the world), the seed did not have the ability to grow within the soul, and when tribulation came, there was no root (the issue is that the person was so obsessed with the things of the earth that they didn’t in grow in God’s Word, and therefore did not grow spirituality to become Believers so that they could handle tribulation, when it does eventually come. If you become obsessed with the things of the world, you cannot be obsessed with God’s Word – you cannot serve 2 masters ~ Matt. 6:24), they did not grow, and by analogy were not saved. The place where thorns (thorns came to this Earth because of sin [Gen. 3:18], and are a direct outgrowth of sin – seldom do we think of thorns in relation to the “cares of this world,” however, because of sin, thorns made the cares of this world far more dominant in our lives as it was no longer easy to receive 100% yield on your crop’s, thorns led to us working by the sweat of our brow [Gen. 3:19]. There is a connection between thorns and the cares of this world, or making a living; which very easily leads to becoming obsessed with riches in the process), grew were those that heard the Word, but because of the cares of the world, and the deceitfulness of riches, did not produce fruit, and by analogy also were not saved. However, the good ground that heard the Word, understood it, and that bore fruit, and is synonymous with the redeemed of God, the Believer. The Holy Spirit is consistent with Christ’s parable in Matthew, and it is the same Holy Spirit speaking through the author of the book of Hebrews – and He does not change, therefore, the typology doesn’t change as well. With the thorns representing the cares of the world, those things used by the devil to quench out the Gospel from growing in the soil of a man’s heart, and Hebrews 4: 6-8 stating that the water falls upon the earth, God’s Word and that which is “herbs meet for them whom is it dressed” which is a reference to the good seed, are therefore the saved individuals; “but that which bear a fourth thorns and briars is rejected, and is nigh unto cursing [ready to be cursed] whose end is to be burned,” is those individuals, that due to the cares of the world did not produce any fruit, and therefore were not saved. The analogy is pretty straightforward. And here Paul says that he is persuaded that they have not fallen away. This word for “persuaded”, means convinced. Therefore, Paul is convinced that the Hebrews had not fallen back into Judaism, and away from the salvation which was yet secured in them by their producing of fruit, which he refers too. Again, why was Paul convinced that they had not fallen away? He says “for God is not unrighteous to forget your work and labor of love, which ye have shewed toward his name, in that ye have ministered to the saints, and do minister,” which for Paul makes the point within his thinking, that because they had produced fruit, they are secure in Christ, and therefore warranted him being convinced of: “better things of them”. Just as the seed that was sown in Matthew was not established until the fruit was produced, so here in Hebrews Paul believes that they are established because they produced fruit, and in the same way today, and until the new “partner” (yet limited partner with the Holy Spirit), displays fruit, we do not truly know if they are a true believer (God knows – but with us as with Paul, our warnings and preaching to others are based upon our own limited perception). The fact is, if a person is saved, then they will produce fruit, which will prove up their salvation, which was determined before the foundation of the earth (Ephesians 1:3-5). The term, “received the knowledge of the truth,” is not a reference to a person that is saved, as salvation is based upon faith, not knowledge – knowing what the right thing is, and doing what the right thing is are two separate considerations. Faith is more than mental assent; it becomes a life-changing adherence to a belief that produces changed behavior and therefore fruit. Belief is a cognitive response only, it is a mental process, but does not necessitate a changed behavior due to a full conviction of the presuppositions. To receive the “knowledge of the truth” will not save you, it is those that do the Will of God the father that are saved, not those that receive the KNOWLEDGE – hearers, but those that do the will of God (Rom. 2:13; James 1:22). There is only one sin addressed in the book of Hebrews, and it is to the Jew Only (it is only the Jew who can return back to keeping the law and the sacrificial system – and only while the Temple was standing between the point that this was written until 70 A.D., afterwards the sacrificial system had stopped as there was no Temple, which was mandated as a place where the sacrifices took place), it is apostasy back to Judaism, for those that are yet established as believers. The temptation for these individuals that were yet concretionized or solidified in their faith in Jesus Christ, who were feeling the tribulation of this new commitment, and were stopping the assembling with Believers (Hebrews 10:25), which would mark them as apostates to Judaism, and return again to the sacrificial system of the law. This is the one main Scripture utilized by many preachers to state that church attendance is mandatory, Biblically speaking. And attending church should be a prime objective of every Believer; this passage is not speaking of assembling in a general sense. It is addressing a specific situation concerning the Jews forsaking the assembling with Believers because of persecution of the Jews of the synagogue. The original language, the statement, “as ye see the day approaching,” is better translated “as ye see the day of trouble approaching,” and fits the context much better. They were told to stay the course, and that there remained NO more sacrifice for sin if they tried to return to Judaism – because the way of salvation for the Jew was to move on to Christianity based upon the foundation of the knowledge of the law. Jesus died for the sins of the whole world, yet only those individuals that place saving faith in that act appropriate salvation. And if these new limited partners, not yet full partners with the Holy Spirit, turn back to Judaism, there are no more sacrifices that can be made beyond Jesus blood – Jesus is the only way to the Father now (John 14:6), the purpose of the sacrificial system was now complete and could not be reentered. Scripture is void of the concept that one can be a Believer, and then become a nonbeliever; any more than a person could be a fruit producer and then be someone who has never produced fruit. There are many different analogies utilized in God’s Word that indicates that either a person is saved, or they are not saved and that there is not a progression from one to the other, from unsaved to saved, from goats to the sheep, from children of the devil to children of God. In Ephesians 2:8, the word “saved” is in the perfect tense, meaning: it started in the past, with results in the present, which cannot be undone. Easily defined, we could say that our salvation started before the foundation of the earth, was paid for at the cross of Jesus, is being played out daily in our lives in the form of sanctification, and comes to full fruition at the “Bema Seat” of Christ. The word “saved” does not reflect a singular, one-time experience, solely completed in the past going on in its results. You don’t just get it now, lose it tomorrow, and get it back. Either you have it, or you don’t have it, the grammar does not allow for achieving and losing it; it does display a progression in its process to a full completeness that cannot be stopped. This word never implies fragility. The idiomatic language that the Holy Spirit uses is for a purpose. When Christ says that we are “born again,” it is for a purpose, and is meant as a description. We have nothing to do with our physical birth, and it is impossible to undo it. It either happens or it doesn’t happen, but either way it is beyond our control. Again, once you are born it is impossible to be unborn, and if you say this is just misuse of the word, then you imply that the Holy Spirit misuses the vernacular. We understand the difference between this title concerning us as adopted into God’s family, and that of Jesus title as the “Only Begotten Son of God” (John 3:16), His deity beyond reproach. We also understand that within the Hebrew culture, this term, “a son of…” could be used as a simile wherein something would be called the son of something else, because the former produced the latter. We see how Angels were referred to as “sons of God” (Job 1:6; Gen. 6:2) in the same way as unbelievers (the Pharisees are a good example) were referred to as sons of the devil (John 8:44). The grammar of the term “to become” is in the Aorist Tense, meaning: “an action that occurred in the past (“once & for all”), it is used to connote certainty. With Greek grammar, if one wanted to establish the complete reality and certainty of something, they could use the Aorist Tense, wherein it would state something as if it happened in the past, beyond the ability to change, yet while reality. Wherein, in the English grammar we have a Past Tense which always speaks of time, something that is already occurred; in the Greek the Aorist Tense may speak about the certainty of something, without referring to when it occurred. Within the grammar of the Greek, every Scripture which deals with salvation does so by using verbs that establish that the words cannot be changed, that there is permanence to the salvation which is referred to. (Rather the verb is in the: Perfect Tense, where the action has taken place in the past, with results in the present. In the Present Tense, where the action takes place currently, and never stops. Or in the Aorist Tense where something may have occurred any time chronologically, yet which is established as a reality which can never change.). For one, it is not used to indicate that the Believer comes from the source of God, or acts like God wherein there is identification with the source. It is God who initiates the enabling “to become,” according to His own power for the believer to become a son of God, based upon a relationship, not a resemblance or the source. The relationship is that of adoption, such as seen in the following Scriptures. There is perhaps no more intimate of a term that we as sons and daughters of God can use concerning God the Father. He chose the relationship, He is keeping the relationship Eternally, and the relationship is based on an intimacy and love beyond human compare. In Romans 5:2, the Word “access” is in the perfect tense, meaning it started in the past, with the results in the present, which cannot be undone. The expression “wherein we stand,” is one Greek word and it is in the Greek present tense, meaning that it takes place now and continues on indefinitely. Which means that this grace in which we stand is also permanent; working within our lives on a daily basis? According to this Scripture there is no way that once salvation is gained it can be lost, otherwise these verbs would not be in the perfect, and present tense. The point is that these specific words that Paul used according to the direction of the Holy Spirit do not allow in any way, shape, or form, for the discontinuance of salvation once it has been gained. The grammar does not allow for gaining access by faith unto God’s grace and then losing it, it is a permanent situation. Of the seven things that Jesus said from the cross, the last thing was “Tetélestai.” And while the King James translates it “it is finished,” there is greater nuance to the word than this. The fuller translation is “paid in full.” And while many non-believers have said that Jesus finished His life, or finished His teaching, or finished His mission, or finished speaking; however, none of these are the Gospel of Jesus Christ. It was Jesus’ death, burial, and resurrection (which is specifically defined in 1 Cor. 15:1-3); which was for the propitiation of our sins that is the Gospel. And it was as Jesus was dying on the cross that He announced He had finished completely what God had given Him to do, by “paying in full”, that which was required. I did not earn my salvation, and you did not earn your salvation as well, not one little bit; you and I did not contribute anything to our own salvation, HE PAID ALL! Therefore, we cannot lose our salvation. Because, we cannot lose what we did not gain in the first place, any more than we can maintain what we have no power to grasp to as well. The above passage says “who shall separate us from the love of Christ…”, and concludes by stating that “… nor any other creature, shall be able to separate us from the love of God, which is in Christ Jesus our Lord”. The person that is saved is a “who”, as well as a “creature”. The answer to that is that man is not saved by his love of God; in fact Scripture states that man does not love God, and did not even search for God (Romans 3:11), nor is he saved by loving God. He is saved by faith in the Gospel of Jesus Christ. We only love Him because He loved us first (1 John 4:19). The point is, that it was NOT the nails that held Him to that tree, it was the love of Christ that held Him on that cross, and this passage (Romans 8:35-39) declares that nothing shall separate us from Christ. It does not state that nothing shall separate us once we die, and are made permanent in Christ. And the point of this text is not our responsibility, but our security in God and His ability. Once we are in Christ Jesus, once we are His, once we are saved: we cannot be lost, because it is Him who saved us; and Him who holds onto us, not allowing anything to get between us, and therefore separating us. Two issues arise concerning this passage, that of being chosen “before the foundation of the world” (one last issue concerning this phrase), and “Adoption” by God. There are those that state that this passage refers to Christians being adopted as believers in general, or a person being adopted into the group of saved individuals. Yet this is an impossibility due to the words such as “us”, which could refer to individuals within a group. If Paul were referring to a group you would have to use a different word even in referring to individuals within that group. And whereas Paul’s introduction is to “the saints that are at Ephesus,” he goes on to state, “Grace be to you”, indicating a personalization of the application. This letter was read to the church as a whole, but its application was to the individual. Paul did not expect the group to only obey in general, alleviating the responsibility of the individual to their individual responsibilities. The application was specific, therefore being “chosen before the foundation of the world” was specific, and having being “predestinated us unto the adoption of children by Christ Jesus to himself” is specific as well. And if a general application is to be implied concerning being “chosen” then there is no specific understanding of this text, and how to apply it to one’s life individually. You cannot depersonalize this text, without depersonalizing the application as well. A specific time is spoken about, “before the foundations of the world”, not general. The application is specific to the individual; otherwise there would be no responsibility to fulfill any mandates, or to apply any aspects personally. To state that God chose Christians, a group of people called by the name of Christ to be saved before the foundation of the world, does violence to the text, and neuters any meaning of its application. To generalize these statements is to contradict the personal application that Paul alludes to. And concerning the word “adoption,” there is no general understanding of applying it to a group of people. Adoption was always singular, dealing with one person, it was personal, and it was immediate in its relevance. The idea of adoption was that of a youth reaching a point of identification and recognition as the heir of the family. Adoption was a legally binding procedure and could not be undone. Once you are adopted into a family, your rights and privileges are the same as any blood family member who would hold the same standing. For God to say that He adopts us, by use of this word, reveals a personal relationship that is permanent and binding, in which He cannot even undo himself. This is what’s understood by this word for adoption which Paul utilized. The word for “sealed” here comes from the word for the signet (usually on a ring) of a King used to seal documents; and once sealed, not even the King himself could unseal it. The point is once we are sealed with the Holy Spirit, we cannot be unsealed, not even by God the Father. References to this can be seen in Esther 8:8, where the King could not unseal the order to have the Jews killed, who was Esther, a Jew; and in Daniel 6:15, where the King could not have Daniel avoid the lions’ den, when the King loved Daniel. We all live under a linear assumption, where time progresses from the past to the present, unto the future. However, it is not at the time of a Believer’s altar call that is the fulcrum of their Spiritual life. Within our own dimensionality we have a hard time understanding how God could predestine a person before the foundation of the earth to be His child. For those that would argue that this is a reference to the calling of “all” those that were “in” Christ as a group, rather than an individual, the grammar disputes this interpretation . And for those that would say this is a reference to the Jews and Gentiles being called concerning the religious beginning of the Hebrew, again the words “before,” “beginning,” and “foundation;” are all references to prior to the creation of the world, therefore this cannot be a reference to a group calling of a man to Judaism or Christianity which occurred much later. If He was not speaking to the individual for which the pronoun demands; or Paul’s proclamation that “there is none that seeketh after God” as found in Romans 3:11; or Jesus words that He came to “seek” out His followers as found in Luke 19:10. Or Jesus’ words that the Father is the one that “giveth” individual believers to Jesus as found in John 6:37. None of these verses hold any significance for the individual, if salvation is obtained through the group. Unfortunately, There are many scholars who teach that a born-again believer can lose his salvation, such as John Wesley (Who taught the heretical doctrine of “Christian Purification,” wherein a believer may attain a state of holiness in which believers are made free from original sin, which devalues the necessity of the atoning work of Jesus Christ upon the cross; as well as assaults the Word of God on this issue. “For all have sinned, and come short of the glory of God” ~ Rom. 3:23. The Greek word for “sinned” is hamartano, and the grammar is that the tense is second aorist, which means that the word is treated as completed fulfilled, as if it was in the past, yet is a current reality. The voice is active, meaning that the person is the one that commits the sin, not something outside of them, or the sin nature in itself. And the mood is indicative, which means that it is a complete reality that the person currently does the action. Anyone who studies the Greek grammar of this sentence understands that it is a present tense situation that is a fact, and never stops throughout the person’s life in the body, it is un-doable. Wesley understood this, as a teacher of Greek at Oxford, and as noted within his commentary. Which leads to the question how could Wesley promote purification wherein a Christian could live a life of sinlessness? ), Adam Clark (Who was a method preacher and scholar, teaching the same things that John Wesley had hired him to proclaim. Yet worst he was a supporter of textual criticism, now often referred to as Higher Textual Criticism which opposed the textus receptus, and elevating the Alexandrian text codices which are corrupt. Textual criticism undermines the authority of the Bible, and openly teaches that the Word of God is NOT inerrant and verbally inspired. They go so far as to take out the word “God” in all their translations regarding 1st Timothy 316, while also making thousands of changes which adulterate the Trinity as well as the deity of Jesus Christ. ), or the writers, such as: Jamison, Fausset, and Brown (Also believers in textual criticism utilizing Alexandrian manuscripts in their work), Thayer (A Unitarian scholar who did not believe in the deity of Jesus Christ, or the inerrancy or inspiration of Scripture) as well as other well-known scholars wherein the believer is unaware that they promote textual criticism, and utilize corrupted Greek manuscripts in their work; which explains how they utilize eclectic corrupted manuscripts that teach their own presuppositions. Their sincerity is not the question, which I believe to be genuine. The issue is what is the common resource that they use in their teaching – which Greek New Testament do they utilize. Election seems so unfair to the human mind, that if God chooses who would be saved, the next assertion is that God chooses who is damned. However, it must be remembered that this is an assertion only in that God’s Word does not teach this side of the issue – it is the logic of man that says that if God chooses some to be saved, therefore He must also choose those that are not. However, when man attempts to utilize logic in understanding God and His Word, he is no longer “walking by faith” (2 Corth. 5:7) but by sight, one of man’s senses, that of his perception which is based upon logic. Logic is meant to help guide man through his life, and to protect him as well as assure that he is not led by the emotions, which never follow God’s Word, but can be easily manipulated to sin, and is inconsistent. Election is an issue that is beyond our own capability to fully understand any more than it is capable for us to understand the Incarnation or the Trinity, or many other doctrines and issues found in God’s Word which would mandate that we would be God ourselves to fully conceptualize the full dealings of God. This is the definition of a true paradox, and all we can do at this point is to accept what God has stated in His Word, and quit trying to make God look fair according to human distinctions. Have we forgotten the lesson of the Potter and the clay as seen in Romans 9:21? God is God, because of His power, not because His righteousness, which seems to equate with man’s sense of fairness. God is the boss, He owes no excuse to any man; especially those that demand He fulfill human requirements of fairness. All we need to know at this point is that the proof in the pudding is the tasting. And that for the individual who makes a confession of Christ, from the vantage point of our perception, it is the fruit that is unto God that proves up their salvation on our earthly plane. Yet it is God, and God alone, that knows these details. There is much more that can be said on this subject, but as this essay is meant to be a starting place for personal research, this would be a good place to stop for now. The last thing I might suggest is to read Endnote #2, “PERSONAL NOTE”; in case you haven’t already done so. Augustine’s expression has been used for over 1500 years; whenever there would be dissent or disagreement concerning doctrine. However, the use of Augustine’s expression becomes abusive when it is used by individuals to manipulate others that disagree with them in order to take control, under the guise of compromise. Compromise has been one of the most effective tools that Satan has every used to dilute the Gospel into complete ineffectiveness. While compromise seems so Christlike, show me one place that Christ ever compromised the Gospel, or anything He said or did. The outcome of individuals and groups laying aside of those things that others deem are nonessential in order to maintain the unity, has been a compromise of the Gospel. Examples of this type of compromise within Christianity, where believers except ungodly practices are self-evident, such as when believers refuse to confront or speak out against the Emerging Church, the World Council of Churches (which goes so far as to celebrate homosexuality, union with Muslims, and rejects the deity of Jesus, and the atoning death of Jesus Christ on the cross for the sins of the world, and much more), even the National Association of Evangelicals (which associates with every type of heretic, and waters down the gospel of Jesus Christ, as well as their stand concerning Islam), and now a majority of national denominations which now accept homosexuality (The Episcopal Church, The Alliance of Baptists, Evangelical Lutheran Church in America, Presbyterian Church [U.S.A.], Unitarian Universalist Association of Congregations, United Church of Christ, Metropolitan Community Church [MCC], and a major segment of the Anglican Church in America.) to the extent that many ordain homosexual ministers, allow for abortion, compromise the Gospel in the name of Islam, and downplay the Divinity of Christ, and the conditions of salvation; all for the sake of unity. I have attempted to answer this question, “why eternal security is important,” objectively; based upon what is preeminent concerning this question, which is the integrity and ability of God to keep that which He has chosen (Eph. 1:4) for Himself. However, there is a subjective aspect of this issue beyond that of the obvious, which is everlasting life spent with God. There is the issue of how this doctrine affects the Believer in the here and now, on this side of the doorway to eternity. Let me speak personally, if I may. I was raised in a denomination which taught that the believer could lose their salvation (a denomination which held to a mixture of what some would refer to as Calvinism and mostly Arminianism – I do not use these terms and recording to myself are others belief systems, it is Christ in Christ alone who is our point of reference, not men in their own presuppositions and teachings; no matter how sincere they are. Therefore, I refuse to allow others to control this conversation and distort it by breaking it down to either being the teaching of one of these two individuals. These pastors lived 1500 years after Christ, and to attempt to utilize their teaching in order to maintain the simplicity and remembrance of these issues is incorrect and unbiblical. We should address Biblical doctrine based upon Biblical doctrine, not the interpretations according to man. There are things that are correct and things that are incorrect in both of these men’s teachings, and I will not be forced into a corner to support or reject either one. It is to Jesus, and Jesus alone, as seen in His Word; that I stand concerning who is my absolute authority. And it is the Holy Spirit that is my guide based upon God’s Word, not some interpretation that men like to lay on the Biblical subject matter which only muddies the water.). I maintained the belief that a believer could lose their salvation while pastoring in full-time ministry and for many years afterwards when I again worked in secular fields of employment. To my shame, I confess that I spent some time running from the Lord after having left the ministry. I was a prodigal, working in law enforcement, and latter investigations attempting to save people my way, while eventually medicating myself concerning my own fears of dying in sin. I maintained my faith in Christ, but was disobedient, and fearful. After I regained my spiritual sanity and “returned” (See Peter’s case when he was “returned” – which is the meaning of the word: converted” ~ Luke 22:32) to the Lord, committing myself again to obedience, I re-examined this doctrine of Eternal Security, finding wise teachers, and digging much deeper in the Greek grammar. I came to the conclusion that once a person became a Born-again child of God, they could be a prodigal; but they could never be unborn; not if they were truly born-again, wheat, as opposed to tares, which appear so similar from the outside. It was not the time I spent running from God that the fear of losing my salvation cost me to reconsider this question. It was a lack of quality maturity in faith all the years that I spent in anguish following Him holding this doctrine. Fearing that even though I was living in obedience, I knew that sin lived deep inside, therefore I feared the loss of my eternal home. And it was all the individuals that came to me with the same fear, that made me come to a place of being willing to consider if this doctrine (losing my salvation) was correct or not. Then I heard a man talk about what the real issue about eternal security was, it was about a lack of integrity of God, and His ability to do what He had stated – which was to keep me. You see the problem with this doctrine of losing your salvation, is it breeds a lack of faith, which in turn motivates the believer to work towards a works-based type of salvation, wherein upon frank consideration there’s fear and trepidation. I mean we all know were not good enough, no matter how hard we work at it, or how much we attempt to convince ourselves, or others that we are good enough. Unless we are reprobate – and I do fear this for some of those that preach that a Believer can lose their salvation, are. Once I became convinced that I was eternally secure, my life changed, both in the sins that so easily beset me, falling away; but also even more importantly in the growth of my faith. I stopped being preoccupied with my sin, and became consumed in growing in faith. The fear fell away, because I came to understand God was trustworthy to keep me; even, and especially if I couldn’t keep myself. Therefore, I stopped being preoccupied with those things which slowed me down and focused on Christ, and faith in Him. I came to understand Hebrews 12:1-2, in ways that I’ve never known before. My insight into God’s Word was blessed by the Holy Spirit, And I have to admit it flat blows me away. While most of the time I am blessed to research and find great teachers of God’s Word, especially those of the 17th and 18th century; at the same time I find the illumination of the Holy Spirit to be amazing concerning original thoughts and teachings, yet always intermingled and supported by God’s Word. However, it is not actually the Scripture which becomes first, then the understanding, then the research into the Greek grammar and linguistics; wherein the outcome is overwhelming to me. It all comes down to this, you have a choice, you can stay fearful about your Eternal destiny, and God’s ability to keep you; wherein you focus and are preoccupied with your sin; or you can grow in faith, allowing those sins to decrease based upon more godly desires of obedience, because you trust God and obey Him because what He has said is just not a law (the rules – once we understand that the law is meant to keep us out of harm’s way, to protect us, it stops being the do’s and don’ts that we are restricted to), but can be counted on as what is best in your life. And yes, sin seems like fun – for a season, but what becomes worse is the preoccupation with it which distracts us from where our focus should be maintained, upon Christ and growing in faith and trusting of Him – in faith. I’ve had a bone disease, cancer, lost houses, and families; watched death take most of the loved ones around me, and have even watched, with tears in my ears as over 500 strangers die in my presence, expressing empathy and compassion for their family as a chaplain in 3 major hospitals, And as interim director for the past year in a large regional facility where I I attended six deaths in the last three days. Will my point is, I’ve had many opportunities to grow in faith trusting that God is in control, especially when it doesn’t look like it. By nature I am an emotional responder and each death I observed cost me something, yet God is faithful. I am a sinner saved by the grace of Jesus Christ, who is more fortunate than I can ever express. Yet, through these trials, I have come to understand that the trustworthiness of God is without end; to the extent I no longer fear, I don’t even fear myself, and ability to mess things up – I can and do. I say this not because I have achieved anything – I am a wretch. But I have learned to kiss the hand of my master, because He means nothing but good for me in my life. Faith is what we are called to grow in, not the ridding and removal of sin (This is what false religions focus on, and do a much better job than we do), the Holy Spirit will help handle that in our lives – seek Jesus, His Word, and to grow in faith and you will become more than you thought is possible. Keep your eyes set on Him! “Wherefore seeing we also are compassed about with so great a cloud of witnesses, let us lay aside every weight, and the sin which doth so easily beset us, and let us run with patience the race that is set before us, Looking unto Jesus the author and finisher of our faith; who for the joy that was set before him endured the cross, despising the shame, and is set down at the right hand of the throne of God.” ~ (Hebrews 12:1-2). Born-again Christian believers are blessed in many ways. Not counting the earthly benefits we receive, the pleasure of spending eternity with God, of awaiting Jesus’ return for His own, the “blessed hope” (Titus 2:13; Romans 8:20, 24-25, 15:4. ), and all the unbelievable treasures we shall enjoy forever in God’s presence ~ (Matthew 6:20, 19:21; Luke 12:33, 18:22.). “So when they had dined, Jesus saith to Simon Peter, Simon, son of Jonas, lovest [agapao= “highest regard”] thou me more than these? He saith unto him, Yea, Lord; thou knowest that I love [phileo= “affection”] thee. He saith unto him, Feed my lambs. He saith to him again the second time, Simon, son of Jonas, lovest [agapao = “highest regard”] thou me? He saith unto him, Yea, Lord; thou knowest that I love [phileo= “affection“] thee. He saith unto him, Feed my sheep. He saith unto him the third time, Simon, son of Jonas, lovest [phileis/phileo= “affection“] thou me? Peter was grieved because he said unto him the third time, Lovest [phileo= “affection“] thou me? And he said unto him, Lord, thou knowest all things; thou knowest that I love [phileo= “affection“] thee. Jesus saith unto him, Feed my sheep.” (John 21:15-17). Feeding sheep refers to leading & teaching disciples / the local church, even if the pastor is lacking. 4. ELWELL’S EVANGELICAL DICTIONARY OF THEOLOGY, Walter A. Elwell, Baker Book House Company, 1984, Software Edition. 5. THE COMPLETE BOOK OF BIBLE ANSWERS, ANSWERING THE TOUGH QUESTIONS, Ron Rhodes, Harvest House Publishers, Eugene Oregon 1997, page 81. 6. Matthew 4:17 – “From that time Jesus began to preach, and to say, Repent: for the kingdom of heaven is at hand”. 7. EASTON’S BIBLE DICTIONARY AND BOOK SYNOPSIS, Ellis Enterprises, Inc., Oklahoma City, Oklahoma, 1988-2000, Software Edition. 9. WORD STUDIES IN THE GREEK NEW TESTAMENT, Dr. Kenneth S. Wuest, Wm. B. Eerdman’s Publishing Company, Grand Rapids, MI 49502, USA, 1990, “Hebrews in the Greek New Testament,” Electronic Media..
← Eternal Life vs. Eternal Security ~ What is Salvation?